Flowers are no doubt one of the most beautiful creatures of God and you can even call them to be the Wonders of World because they are found in varieties of types. If you ever get the chance to travel all around the Globe you will probably be finding so many types of flowers whose beauty will definitely going to make you forget blinking your eyes. Here we will have 20 amazing and mos beautiful flowers even found in the world! These flowers are mostly find in the small size shapes. They are much found inside the regions of the Asia along with the Southern side of the Europe. You would be finding this flower to be readily accessible at the best in almost 300 species. The name of this flower is all derived from the Green language. You would be finding this flower as accessible in the colors of pink, purple as well as red and white color. On the 19th spot, we would add you with the name of the Cherry Blossom. This is one of the most beautiful flowers in the world with the incredible beauty. You would be mostly finding it in the place of the Japan in their spring season. The most prominent colors which you will be finding in Cherry Blossom are white and pink. On the next we would bring you up with the name of Flores III. This flower is so stunning looking with its appearance that would make you fall in love with it. It has colorful and striking looking petals. Did you ever check out the lavender flower? This flower is much captured inside the forests along with the stems of the trees. You would be finding them mostly in shades of the purple and blue. They are small in terms of the size shapes and strong with their smell. Corpse Flower is coming out to be one of the magnificent looking flower which you would mostly be finding in the Western Sumarta. This flower has the striking form of the pleasant smell that would catch your attention in just first look. It is made extra stunning with the mixture of the various color shades in it. Sweet Pea is the just flower which you would be finding used at the high scale in the cosmetic products. This flower is known out to be the main sign of the pleasant and happiness. Dahlia is mainly found in the Mexico, Colombia and Central America. Dahlia has over 30 species. It consists of a floral head that is all surrounded by several delicate petals. 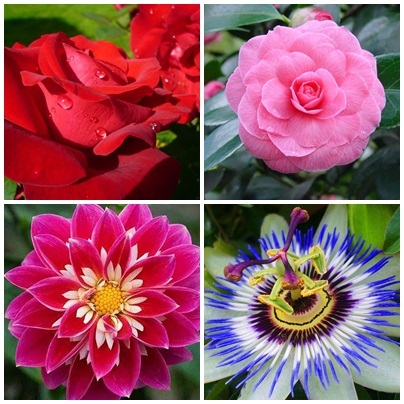 These flowers come in various shades in which we have orange, red, pink, purple, white and much more. Passion Flower is next on our list which you would be finding in almost 50 different kinds of the species. They are included with almost 10 sepals and petals that are about 10cm in the width. This flower do consists of the high medicine benefits. White Lotus is another one of the lovely and beautiful flowers in the world. This flower is standing at the 12th spot on our list. This flower is much found in the Asia along with the African sides. This flower is much able to grow in the water or ponds. Its upper body is white in color and leaves are green in shade. Plumeria is the flower that is famously found at the high scale in the places of the Brazil as well as Caribbean and along with some of its species in the place of Central America. You would be attracted towards this flower because of its strong smell. This flower is majority of the times accessible in the colors of the pink as well as red and even in the yellow. Canna is standing at the 10th spot on our list. It is the form of the plant that belong to the flowering plant families such as Zingiberaceae all along with the Musaceae plus the Marantaceae and yet the Heliconiaceae. Ranunculus is one of the attractive looking flowers which you would be finding best for the purpose of the medicine and health. Yellow as well as pink and red are some of the prominent colors found in this flower specie. This flower is also known by the name of the buttercup. Lily of the Valley is standing at the next spot on out list that comes out to be most beautiful flowers in the world. This flower is all accessible in the pleasant and lovely form of the smell that do make everyone fall in love with this flower. On the 7th spot we would bring you up with the name of Magnolia that is said to be present in almost 200 various species. Few of its common colors are purple and pink. This flower is much found in the length of the 3 inch to the 12 inch. You would be finding it much in the regions of the West Indies along with the central America and even inside North America. This list is incomplete if we would not be mentioning out the name of Tulip. It is another one of the most top and most beautiful flowers of the world. You would be finding this flower to be present in the high quality in the place of Europe. This flower was for the first time found in the place of Iran. They are mostly grown in the pots. Peony would be next on our list as being one of the most beautiful flowers in the world. This flower has the strong smell along with the powerful strong color. You would be finding them to be catch in so many color options such as red as well as purple. 4th spot of our list is added with the name of Orchid that is found with almost 23000 various species in this world. This flower is white in color that looks the symbol of the peace and harmony. This is the main reason that millions of people get attracted towards the beauty of this flower. Statice has been popularly known out to be the sea lavender because of its strong resemblance to lavender. It showcase the symbol of remembrance. This flower has been given the name of Bird of Flower because of its shape and size. It is unique looking and has vibrant shades in it. It is multi color but it does not have any scent. On the last and yet at top of the most beautiful flowers we have Rose! It would not be wrong to say that Rose is the king of all the flowers. Rose is a perennial form of the plant that is present in almost various 100 species. You would be finding this flower to be present in the form of the loose petals or even in the loose form. This flower is identified to be the main symbol of the love and affectionate feeling.